The Paddle Wheel Saloon, known affectionately as “The Wheel,” is a great place to hang out and pass the time. The drinks are strong and inexpensive, the bartenders and clientele always entertaining. On most mornings you’ll find a powwow of long-time locals sipping Bloody Marys and rolling dice; most evenings there’ll be a few off-duty resort workers playing video poker. Later at night the crowd tends to grow, a younger scene gaming, throwing darts and feeding money to the jukebox. Anytime of day you can find a few tourists sipping cocktails, escaping the high prices of the Hyatt across the street. The Wheel is also a sports bar, showing most major sporting events on their dozen or so TVs. It is one of the last smoke-friendly bars on the north shore of Lake Tahoe. The Paddle Wheel Saloon is open daily from 8 a.m. until whenever. Whenever you do go, you’re sure to have a “wheel” good time. If you’re looking for a romantic dinner made with fresh, natural ingredients, look no farther than The Soule Domain. Housed in a mid-century cabin in the shadow of the Tahoe Biltmore, The Soule has been producing French-based cuisine fused with Asian and Mediterranean influences since 1985. The split-level log cabin dining room is rustic and cozy, warmed by a fireplace. 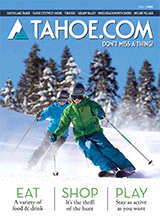 Tahoe memorabilia decorates the wall, and you’ll find fresh flowers and candles on every table. Start with lobster wontons, escargot or lamb ravioli before moving on to pork tenderloin, lamb, duck, filet mignon or curried almond chicken. Be sure to check out the seafood specials or other nightly additions. Whenever possible, sustainable seafood, organic meats and free-range poultry are used along with local, organic produce. Vegan, vegetarian and low-cholesterol dishes are available, too. The wine list is deep and eclectic with a nice mix of domestic and European bottles. The Soule Domain is open nightly for dinner, and reservations are highly recommended. If you’re willing to go a little off the beaten path, the combination of intimate setting and exquisite flavors is sure to provide for an idyllic evening.